"Phenomenal cosmic power, itty bitty living space!" That joke doesn't really apply to wearing this costume, but can you blame us? Every single minute of Robin Williams' Genie performance is pure genius. You think some street rat (apologies to all street rats out there) like Aladdin could ever hope to get anything right without Genie by his side? We don't think so. Genie is the only reason Aladdin found his way to the top. In fact, deep down, Jasmine probably loves Genie, not Aladdin. Sorry, Al. The truth hurts. 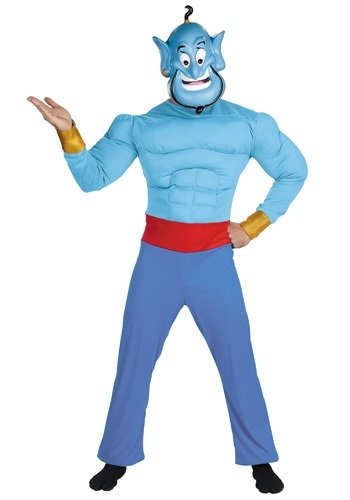 Fortunately, Genie is a gentleman... well, gentle genie, and would never backstab a friend. Besides, Apu would never forgive him. You know how stubborn monkeys can be! That's fine. Genie can get loads of girls! Especially with those fun impressions he does. He's a babe magnet. We suppose it helps that he can make a woman's every wish come true. Literally (we know we don't have to add "literally" to that since he's obviously a genie and obviously genies grant wishes, but it kind of pushes the point home, you know? Genie would get it). So what would you do with great cosmic power? You'd use it responsibly, right? Well... most of the time. Imagine all the wishes a genie could grant himself (or herself!). You'd make a great genie. Help your friends do fun stuff, meet the woman of your dreams, grant her three wishes (not too many or people go crazy with power). That's the life. Sure, you have to live in a lamp and all that but it's a really nice lamp at least.